Rarely seen on the silver screen outside of the animated adventures of Wallace & Gromit and the occasional horror flick about killer livestock, sheep have long been denied the movie exposure accorded other members of the animal kingdom. Is it due to some collective case of denial over the source of our favourite wool sweaters? Or is this distaste due to painful memories of childhood traumas that occurred during singalongs of "Baa Baa Black Sheep" and "Old MacDonald Had a Farm"? Only our psychotherapists can know for sure. Hopefully, this abominable practice of barnyard discrimination will come to an end with the arrival of Sweetgrass, an American documentary that puts these creatures front and centre for what may be the first time. 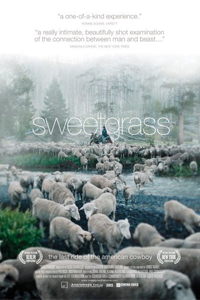 A surprise hit on the festival circuit last year that begins a Toronto run at the Royal this weekend, Sweetgrass depicts a year in the life of several flocks in the Absaroka and Beartooth mountain ranges in Montana. A team of artists with backgrounds in visual anthropology and environmental studies, Sweetgrass directors Lucien Castaing-Taylor and Ilisa Barbash favour lengthy shots of sheep mostly being sheep in a variety of often stunning landscapes. Their movie has no music, narration or much of anything else that other filmmakers typically use to add drama to nature-oriented documentaries. Instead, the viewer comes to feel like part of the herd, an experience that may send some audience members to sleep but will prove to be curiously compelling for others. Though the film's mood is mostly serene, it's still punctuated by surprising moments of humour and tension. Seldom seen in the opening stretches, the animals' human guardians are the sheepherders and cowboys who tend the sheep, collect their wool and protect them from predators. The last task proves especially difficult during the film's final section, which depicts a long and stressful drive across snow-covered ridges and valleys. The fact that this was to be the last instance of traditional sheepherding practices in the region lends a certain poignance to Sweetgrass. What Castaing-Taylor and Barbash document is the end of a way of life. The harsh economic reality for the people involved becomes evident when we hear a sheepherder vent his frustrations in a cellphone call — his very liberal use of profanities seems even more extreme when juxtaposed with the pastoral beauty of his location. The presence of a hilariously laconic old cowboy adds echoes of cinema's most famous representations of the American west. In its own subtle way, Sweetgrass compels viewers to lament the loss of the real thing, and perhaps consider the fraying bonds between humans and the animals that have long provided so much for us. Of course, the real stars of the show remain oblivious to any of the weightier matters at hand, which is part of Sweetgrass ' charm. If there's anything we can learn from the creatures here, it's that any day in which you don't get stripped of your coat or eaten by a bear is probably a good one.